HE Kyabje Drubwang Sangye Nyenpa Rinpoche began the second day of teachings on the The Ganges Mahāmudrā (Mahāmudrā Upadeśa) summarizing key aspects of the first afternoon session. Given their importance, he re-emphasized the four characteristics of the student who can be taught the profound instructions. These characteristics – enduring hardship, guru devotion, bearing suffering, and intelligent wisdom (prajña) – are key for any student who sincerely takes to heart that Mahāmudrā cannot be shown. Using the analogy of moonlight hidden by clouds, Rinpoche stressed that obscurations of thought also dissipate from the mind illuminating the basic luminosity that is present in all of us. In order to actually look at thought requires developing certainty to rest in this inexpressible nature of mind. The student should consider the nature of thought as an aid for practice in itself. Rinpoche alluded to and quoted the ninth chapter on Wisdom from Shantideva’s Way of the Bodhisattva (Bodhisattvacaryāvatāra) in which it is stated that the antidote is meditation and analysis. Through the practice of meditation, we can see that thoughts have no basis. This is the self-liberation of thoughts and is akin to a knotted snake uncoiling itself. However, fortitude is a necessity and we must develop diligence to make our thoughts an aspect of our practice. Milarepa, he noted, used the nature of space as the best analogy since it transcends characteristics. Similarly, the essence of mind transcends color and shape and is luminous in its nature. Drawing again from Shantideva’s Bodhisattvacaryāvatāra, Rinpoche noted that this text stresses several steps in order to realize the nature of mind, in particular cultivating bodhicitta. For example, when we develop the qualities of the mind of enlightenment (bodhicitta), this encourages excitement to engage in practice which necessitates confessing our misdeeds leading to taking bodhisattva vows. When we enact these vows, it requires maintaining awareness and using mindfulness which enables us to rejoice in the luminous nature of our mind. We must apply the antidote which is meditation and analysis. Most importantly, in this precious human life we must not waste this opportunity of mind. 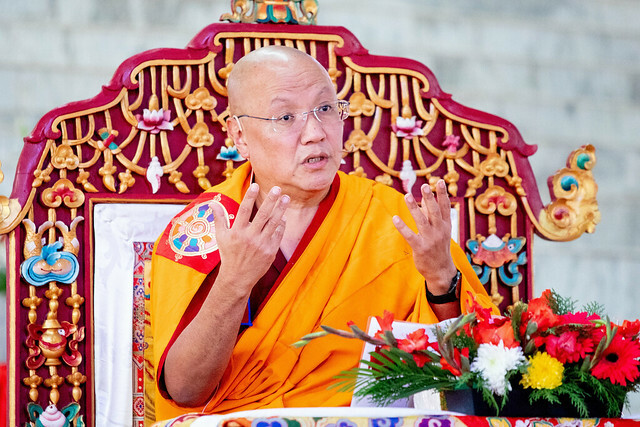 Following the bustle of a butter-tea break, set to the umze-s and other participants chanting Green Tara, Rinpoche concluded the session with an emphasis on three key points: the View, Meditation, and Conduct. These must become inseparable from our practice and the path. The View takes into account the inseparability of mind and appearance. If we meditate on our actual view, he noted, then what we are viewing are the projections which are mind, all that is pleasant and unpleasant. We have to cut through dualistic attachment and fixation on things as truly existent. For instance, we know that greed and delusion are not nature as they are removable. They arise and cease. We look at the nature of delusion and then mistaken thoughts will subside. Can’t be obscured by aeons of samsara. Regarding this last line, Rinpoche emphasized the luminous essence of mind cannot be obscured by aeons of samsara. “The coemergent wisdom of mind is not obscured if you know the nature of samsara, then that is nirvana,” he stated. Another practice for realizing the nature of mind is chöd since its aspect is cutting through ego-clinging. By cutting through ego-clinging, we see that thoughts are not truly existent in and of themselves. This is actual self-liberation. With the next two verses, he continued to elaborate upon the View, the essential nature of the mind, which cuts through projections and knows all phenomena are emptiness. In fact, appearances are mind and mind is emptiness. We need to have confidence in this View in order to have luminous compassion which is all-pervasive. Yet, if we think that sentient beings and suffering are truly existent, we need to train in the practice of exchanging self with others (tong len). Then, we will be able to see that we must have prajña. The View and Meditation have to come into union and progress together. Meditation has to be neither distraction, nor fixation. These two, View and Meditation, serve as the basis for Conduct which Rinpoche elaborated upon in the afternoon session.